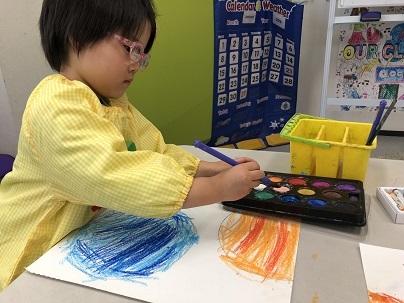 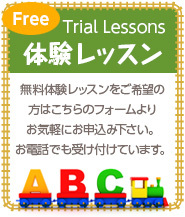 Preschool Advanced Class’ topic for the month of January is Space. The students learned the things that are in our solar system, what are they made of, how long it takes for each of the planets to orbit the sun, what are their distinctive qualities, how the moon got its craters, what the atmosphere does, and how rotation affects the days, weather, and seasons. More than just introducing vocabularies and using them in sentences, our goal is to let the students learn through experience so throughout the month, we used our newly installed projector screen to show them videos about the planets and other objects in space. 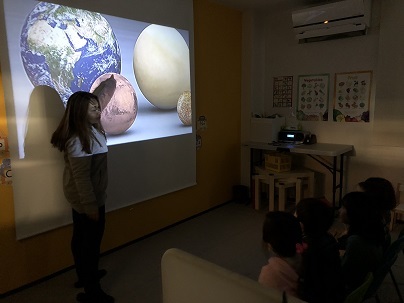 The audio-visual presentations helped aid the teacher’s explanations by making it more appealing and “more real” for the students. 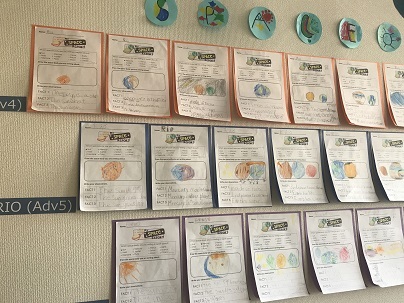 The students got so into it that they started watching videos about space even at home and talked about what they learned or asked new questions when they come back to school. 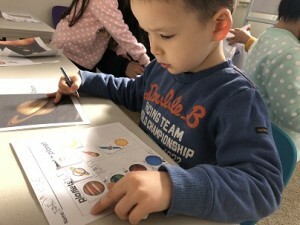 Having the students interested in the topic has helped increase their exposure to English as they watch videos and listen to songs even at home. 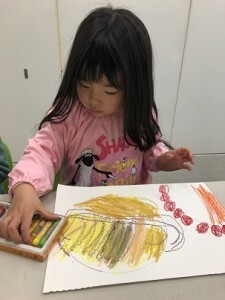 Our monthly topic was also accompanied by some science experiments. 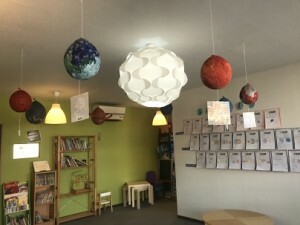 One of which is when they learned how the moon got its craters. 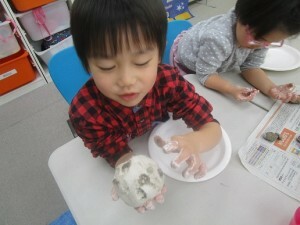 We used clay and some stones that we picked up from the park. 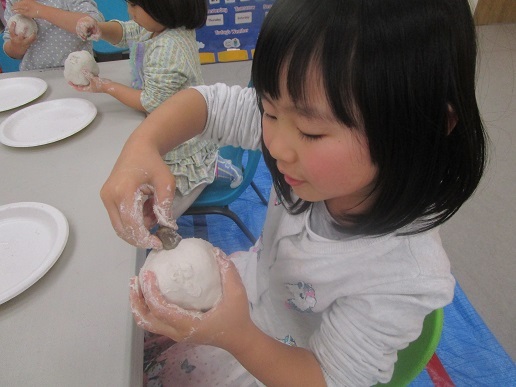 The kids enjoyed making craters on their own moon by slamming some “asteroids” on it. 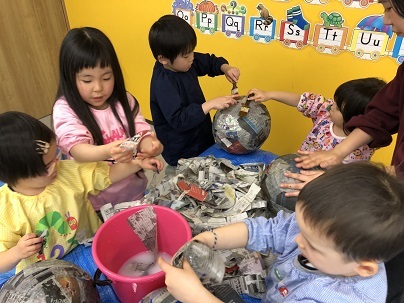 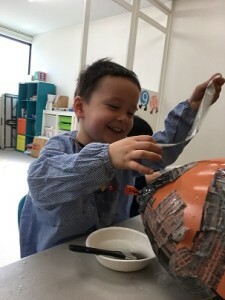 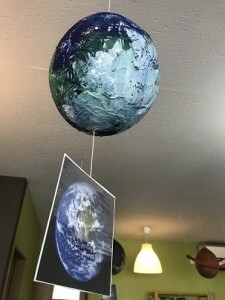 To wrap everything up, we made our own “planetarium” by making paper mache planets that we hang inside the classroom. 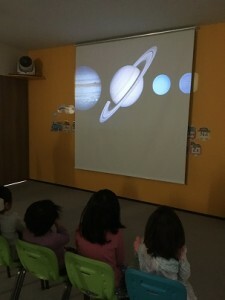 We invited the parents over so they can watch the students explain the things they learned especially about the planets.